A luxurious, rich, soothing emollient blend of plant-based extracts in a Shea Butter base. 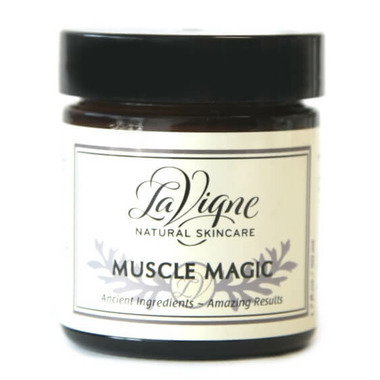 Muscle Magic Balm comforts and soothes your aches and pains. Their formula contains no peppermint scent, parabens or harsh chemicals. Directions: Apply topically to skin, massaging in gently. Re-apply as needed. Aqua (Purified Water), Butyrospermum Parkii (Shea Butter), Theobroma Cacao (Cocoa) Seed Butter, Stearyl Alcohol, Mimosa Tenuiflora Bark (Tepezcohuite) Extract, Glyceryl Stearate, Arginine, Arachidyl Alcohol (and) Behenyl Alcohol (and) Arachidyl Glucoside, 1,2-Hexanediol (and) Caprylyl Glycol (and) Tropolone, Capsicum Frutescens Fruit Extract, Arnica Montana Flower Extract, Boswellia Serrata Extract, Rosmarinus Officinalis (Rosemary) Oil, Betula Alba (Birch) Bark Extract, Plukenetia Volubilis Seed Oil (and) Tocopherol, Rosmarinus Officinalis (Rosemary) Extract, Yeast Extract.